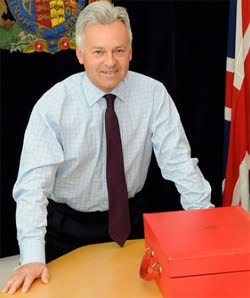 Alan Duncan, the first Conservative MP to voluntarily come out as gay has told media to “back off” covering William Hague, his wife and rumours of a gay affair with a 25-year-old aide. He described the way the foreign secretary's personal life has been covered as "contemptible". Mr Duncan, who is minister of state for international development told the BBC Radio4′s Any Questions that Mr Hague is “a very special politician and I think the way he has been pilloried this week has been contemptible." He added: "Leave them alone now. Back off and let's get on with watching a very, very competent Foreign Secretary and a serious figure in our politics get on with his job." On Wednesday, Mr Hague's special adviser Chris Myers, 25, resigned, citing the pressure of "untrue and malicious allegations". Rumours about the relationship between Mr Myers and Mr Hague intensified last weekend, after the political blogger Paul Staines, better known as Guido Fawkes, claimed the pair had shared a hotel room during the election campaign. Yesterday, Tory grandees Lord Tebbit and John Redwood raised concerns about him sharing a hotel room with a young male aide and also questioned the extraordinarily personal statement he released on Wednesday. In it, Mr Hague, 49, detailed his wife Ffion's numerous miscarriages in an attempt to prove he is not gay. He also revealed that the couple had lost a pregnancy during the summer. Mrs Hague is understood to be a deeply private person, who has never granted interviews to the media. A number of political figures have suggested he was given poor PR advice and reports suggest he made the statement against the advice of Tory press handlers. Mr Duncan told the Any Questions: "I know William, I know Ffion and I don't like the way that they have been treated. "I think the way he has behaved, the way Ffion has behaved has been admirable – composed, calm, dignified – and I think it is wrong for British politics that a couple like this should have been subjected to what they have been subjected this week." Mr Duncan was critical of the BBC for interviewing the Speaker of the House of Common's wife, the Labour campaigner Sally Bercow about Mr Hague. He said including her was "ill-advised and tasteless.” Mrs Bercow told Today that Mr Hague was the victim of "duff PR advice", saying: "You don't need to disclose this level of detail to prove you're not gay… It's elevated something that was circulating on the internet to the national press and the national media." Labour leadership contender Ed Miliband told the programme: "I'm no friend of William Hague, but I am a strong defender of him and Ffion Hague in this case, because it makes politics profoundly depressing. "He and his wife are being subject to a whole series of unfounded rumours. I don't think they go to his fitness as Foreign Secretary. I don't think there are any allegations that I have seen that speak to his ability to do the job."